A Philadelphia schoolteacher who yelled and cursed out police officers during a protest last August over the Frank Rizzo statue will not have to face any legal consequences for his actions. Police have been informed by the D.A. 's office that Progressive Larry Krasner, our new D.A. bought and paid for with more than $1 million of George Soros money, has dropped the charges against John Sheerin, who had been arrested and charged with harassment and making terroristic threats. Police said that Sheerin, 63, a teacher at Julia De Burgos Elementary School in North Philadelphia, got into an argument with the cops and cursed them out. It happened at a rally where protesters were chanting "Tear it down." 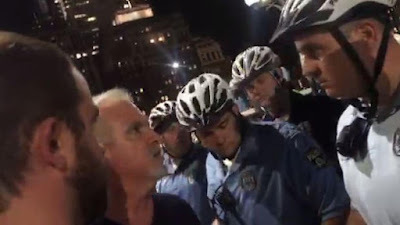 Sheerin, standing at a police barricade in front of the statue, was recorded on a cell phone video yelling obscenities at white "racist" cops who were guarding the Rizzo statue at Thomas Paine Plaza. Sheerin was suspended by the school district, pending an internal investigation. But now that Krasner has let him off, he can return to his job and teach our kids how to curse out cops and get away with it, all in the name of social justice. The decision by Krasner not to prosecute Sheerin comes eight days after the progressive new D.A. 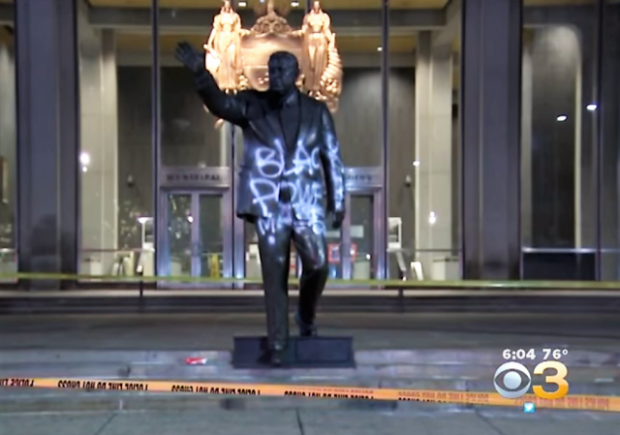 's office announced it would not prosecute Diop Olugbala, a black Communist activist caught on camera by Fox 29 last year spray-painting the Rizzo statue. Now that Krasner is in charge of law enforcement in our city, public vandalism is no longer a crime, at least when it comes to attacking the Rizzo statue. Olugbala, as reported by philadelinquency.com, was represented by Michael Coard, a civil rights lawyer who was a member of Krasner's transition team. On a facebook post, Olugbala announced the dropping of the desecration charge against him. "My upcoming Jan. 10 trial will be continued based on a number of factors, which gives me the opportunity to mobilize further support for critical struggles to free black political prisoners --- including the cases of #st.pete3, rakem halogen, Takiyah Thomson, Mumia Abu Jamal and the 2 million black men and women held captive in u.s. prisons." It's a great day for protesters and lawlessness; for the cops and the rule of law, not so much. Correction - none of the 4 charges against Wali Rahman (Diop Olugbala) have been dropped at this time, although it's certainly possible there may be a plea deal before the next court appearance in March. I doubt convictions would be likely in either case so the DA probably wanted to avoid a loss or hung jury. Sheerin will claim he was just exercising his free speech rights. His arrest already cost him because he was suspended from his teaching job, and his reputation suffered. It seems doubtful they could get a conviction for Olugbala despite clear evidence. At least one juror would probably hang the jury in the name of Black Lives Matter. The city plans to move the Rizzo statue so that is a victory for the protesters. William Penn was a slave owner. That can't be said about Big Frank. Is it time to replace his statue with MLK Jr. or Joe Frazier? Maybe we should replace the Frank Rizzo statue in front of MSB with one of George Soros. Better yet we should remove the William Penn from the top of City Hall and replace him with a George Soros statue because it now seems like Soros is calling the shots in Philadelphia.